Jumping is a very natural activity for dogs. However, you must first check with your vet to ensure that it is safe for your dog to jump on command, as jumping can injure a dog. Do not let your dog jump too many times in a row and ensure jumps are done on a soft surface - rubberised floor or grass. A dog should never jump higher than its shoulder height. In order to teach your dog to jump on command, you will need a long dowel or broomstick, as well as a hoop - a child's hoolahoop is perfect. Another person - to hold the stick or hoop, may also be required. Tips on how to teach this trick without the assistance of another person are below. Hold the stick or hoop, while your dog is on a leash, one or two inches off the ground and say 'jump' or 'over' while leading your dog over the stick by his leash. Praise and reward him once he completes the jump. Choose one command - jump or over. It will be easier for your dog to understand what is expected of him. If your dog is having difficulty going over the stick, put it on the floor and get him walk over it several times. Once he understands what you want him to do, get rid of the leash (if it was required to help the dog to go over the stick) - do not let it dangle. Take it off all together so it does not get caught on the bar or hoop. This is also the time to gradually increase the height of the jump. If your dog tries to go under the stick, it's too high too soon, or too high in general. Put your dog in a sit and stay position with the dowel a few feet in front of him. Then move in front of your dog with the stick between the two of you. Show your dog a treat and encourage him to come and get it. When he goes over the stick - either by walking or jumping, say 'jump' or 'over' then praise and reward. Do not give him the command if the dog walks around the stick, as he will associate walking around the stick with the 'jump' or 'over' command. Eventually you will be able to increase the distance between you and the dog, as well as discontinue the use of treats. 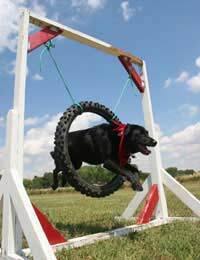 The verbal praise and enjoyment of the activity will be reward enough for a dog that enjoys this activity. Once your dog is comfortable with this trick, it is possible to start introducing more obstaces to jump over, e.g. your arm, another dog that is in a down-stay or even over one of your kids. You can also teach your dog to jump into something, be it your car or your arms.